Highlights from the third round of the WGC-HSBC Champions in Shanghai. Tony Finau will take a three-shot lead into the final round of the WGC-HSBC Champions, as Justin Rose let his advantage slip over the closing holes. Finau finished with three consecutive birdies to post a two-under 70 at Sheshan International and retain his overnight cushion, as Rose lost ground after dropping three shots over his final two holes. The defending champion found water at the 17th and 18th to slip back to 10 under, with Xander Schauffele and Patrick Reed joining him in a share of second. 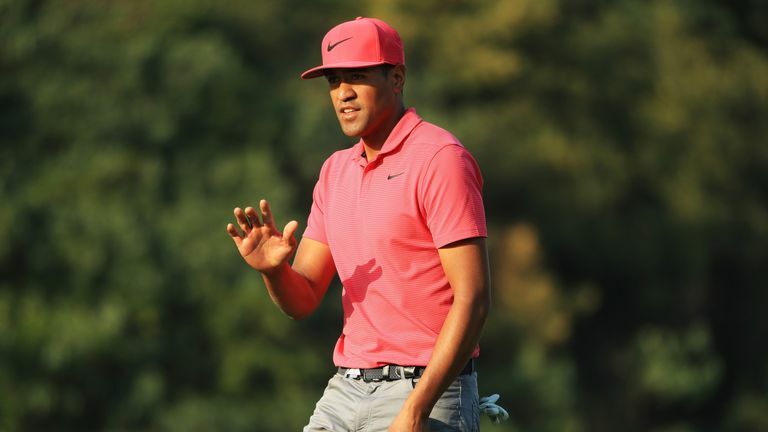 Finau began three clear but cancelled out a birdie at the second with a bogey at the next, where Fleetwood holed from the fringe and converted from 10 feet at the fourth to get within one of the lead. Rose birdied the second and added a 20-foot gain at the fifth, where Finau three-putted for bogey, to grab a share of the advantage before moving ahead with back-to-back gains from the seventh. The Englishman failed to get up-and-down to save par from the sand at the ninth and reached the turn one ahead, as Fleetwood kicked off his back nine with a birdie to get within one. Rose restored his two-shot cushion with a 15-foot birdie at the 13th, while Fleetwood's hopes faded after finding water with his approach into the par-five 14th and then three-putting for a triple-bogey. Three gains in a five-hole stretch briefly lifted Reed within two of the lead, before the Masters champion bounced back from a blemish at the 15th to drive the par-four 16th and join playing partners Finau and Rose in making birdie. A three-shot swing at the 17th saw Rose find water off the tee and knife his chip across the green on his way to a double-bogey, as Finau fired his tee shot to tap-in range and regain top spot. Rose found water again when attacking the par-five 18th and failed to get up-and-down to save par, as Finau elected to lay up and rolled in a 15-footer for another birdie. Reed also birdied the last to post a two-under 70, while Fleetwood sits a further two stroke back in tied-fifth alongside Andrew Putnam after a level-par 72. Rory McIlroy is in the group tied-60th following a three-over 75, while Race to Dubai leader is a further two strokes back after a third over-par round in as many days. Watch the final round of the WGC-HSBC Champions live on Sky Sports. Live coverage begins on Sunday from 3am on Sky Sports Golf and 5am on Sky Sports Main Event.